The term Wi-Fi is actually not an acronym for anything and contrary to popular belief, it does not stand for Wireless-Fidelity. It is just a trademarked brand name that actually means, Wireless Local Area Networking based on the IEEE 802.1 standards. To most of us though, it just means Wireless Internet. Almost every home in our neighbourhood has Internet service and Wi-Fi from one of the main Internet Service Providers (ISP); Shaw, Telus, or Rogers. Some of us have opted to include all of the 3 services, CableTV, Home Phone, and Internet as a bundled package from their supplier (ISP). Your ISP has probably installed two devices in your house; a MODEM and a ROUTER. These two devices might be combined into one physical device but their functions remain different. The MODEM is used to receive the signals (CableTV, Internet, and Phone) from the ISP via a coaxial cable from the street into your home. We use Shaw in our home and they have installed a MODEM in the garage panel. CableTV – all of our CableTV signals are split into as many cables as you have TV’s in the house and are run to each TV from the modem in the garage. Home Phone – one phone cable run goes to our base station of our wireless phones. Internet – one cable (Ethernet) is run from the MODEM to our ROUTER located in a central location in the house. Also, several other cables are split at the MODEM and run to each location in the house that you have ‘hard-wired’ Internet to computers and other devices, such as a Security system. Usually hard-wiring a computer gives you faster performance and a more secure connection, such as a Gaming PC, or Entertainment Server. Your laptops would more than likely use Wi-Fi so that you can move around the house with them. If the MODEM’s job is to receive the signal from the ISP, the ROUTER’s job is to distribute (route) the Internet signal as a wireless (Wi-Fi) signal to all your wireless devices. This is why we want the ROUTER to be in the most central location in your house since it has to ‘cover’ all floors and areas with the Wi-Fi signal. 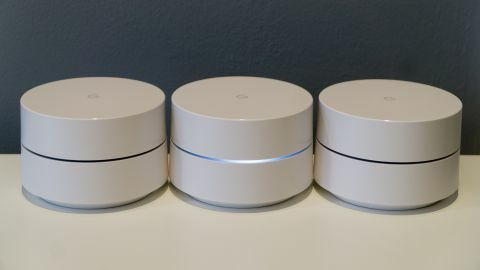 If you find that there is not adequate coverage with the ROUTER, you may want to consider installing a MESH Network which provides your house with multiple broadcast devices called Wireless Access Points (WAP). We have installed the Google Wi-Fi MESH Network which consists of 3 different WAP’s (one for each floor) to give us complete coverage, including our outside security cameras which are wireless. One of the 3 WAP’s connects wired to the ROUTER and the other 2 WAP’s connect wirelessly to the 1st one. This gives us excellent coverage and with the App that comes with Google Wi-Fi, we can monitor all of the devices on the wireless network and even prioritize signal and restrict access. It also allows us to easily change the Wi-Fi password and the SSID (see next section). You can find it cheaper on Amazon, but here is a link to BestBuy. Your Wi-Fi Networks are given unique names when they are installed by your ISP to identify your network. 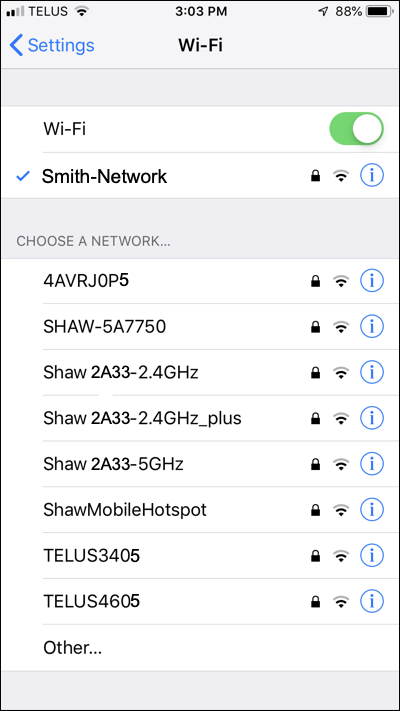 These names are called SSID’s (Service Set Identifier) and are sometimes just a garble of letters and numbers, such as SHAW3H64-2.4GHz or TELUS2205-5G. These SSID’s are what you use to find your specific network to connect to it with your phone and computers. The names that are given them give some clues to your network. Shaw 2A33-2.4GHz tells us that obviously your ISP is Shaw and that you have a Dual Band network 2.4GHz and 5.0GHz frequencies. The 5.0 GHz band will allow you to achieve higher throughput rates to an individual device. However, the frequencies in this band can’t travel as far as the 2.4 GHz band. 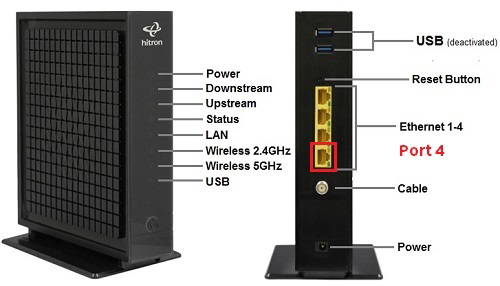 Hence, as a device moves further away from the modem, it may be advantageous to switch from 5.0 GHz to 2.4 GHz. Each network has its advantages and disadvantages. The same password applies to both. Your devices will usually figure out which is the best band to connect to and usually computers and phones automatically choose 5.0GHz and devices like printers and cameras choose 2.4GHz. Some people recommend changing the names of your SSID’s or even not ‘broadcasting’ them to the public, but any good hacker can find the names and configurations anyways. I personally recommend changing the name for no other reason than it shows you have some knowledge of how your network works and are less likely to be careless with security and passwords so any potential hacker might move on to the next home, much like the effect of Security stickers on your windows. The acronyms WEP, WPA, and WPA2 refer to different wireless encryption protocols that are intended to protect the information you send and receive over a wireless network. Choosing which protocol to use for your own network can be a bit confusing if you’re not familiar with their differences. Without going into a lot of detail on these options, if you can, choose WPA2 as it is the most current and secure. This one is pretty obvious that you don’t want to create a password that is easily guessed or hacked. Once you enter it the first time on your device you can choose to “Save Password” it and then you won’t have to remember it each time. Therefore you should create a strong password. Should contain at least one UPPER and one lowercase letters, at least 1 number, at least 1 special character like $&#, and be at least 8 characters long. Example: TrUcK-5233! Make sure you change the password that the network came with which is usually “admin” or “password” and I recommend changing it at least once every 3 months. When you are at home, your smart phone will get its Internet from one of 2 sources; cellular or your Wi-Fi. Since your Wi-Fi data is likely cheaper than your cellular data it is always best that your phones connect to your Wi-Fi automatically when you are at home. When you are away from home cellular data charges can add up so it is best to connect to secure wireless Wi-Fi. But be aware, connections to public Wi-Fi may seem secure but they rarely are. 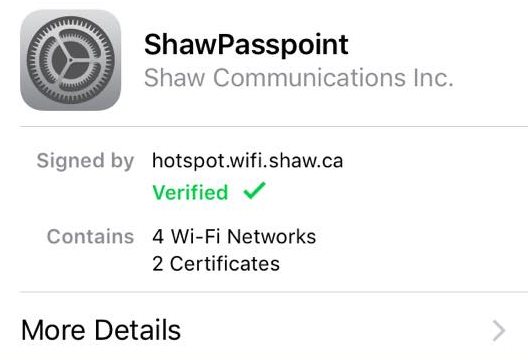 If you are a Shaw customer you can set up ShawPasspoint to automatically connect your devices in a more secure manner. You first need to register your device on the Shaw website.